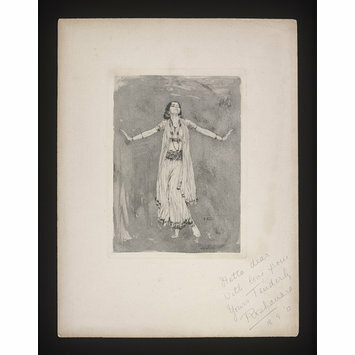 Sepia print of an original watercolour painting, showing a full length image of English dancer, Roshanara (Olive Craddock) (1894-1926) in costume. The print is signed by the artist E.Farro. The subject of the print has added a handwritten dedication in pencil at the bottom right hand corner, this is dated 18th September 1913. Once Craddock had chosen a performing career she adopted the name of a Mughal princess (1617-1671) whose name meant ‘Light-Adorning’ and was reputed to have been the first to travel outside her own country. 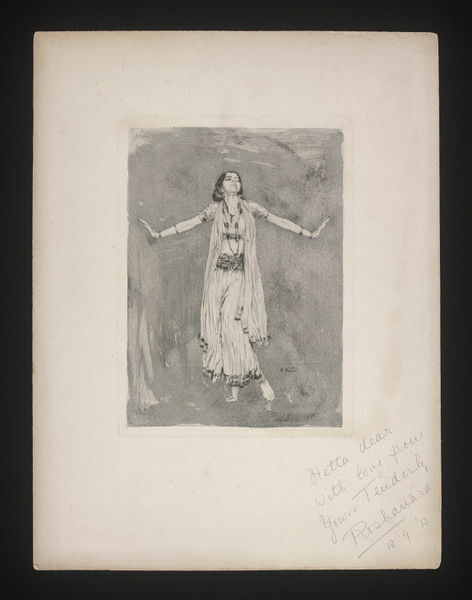 In about 1909 Craddock travelled to Europe with her mother and appears to have worked briefly with Loie Fuller before, in 1911, having studied with Tortola Valencia, she appeared as the Almah in Kismet at the Garrick. In 1911 (14, 18, 21, 25m November & 5 December ) she appeared five times as Zobeide in Schéhérazade for the Ballets Russes at Covent Garden, London. In 1912 Roshanara had a season at the Palace Theatre, London and in the Autumn had a speciality spot on Anna Pavlova’s British regional tour presenting her Incense, Village and Snake dances. In 1913 Roshanara danced at Tivoli, London and in July-August 1914 danced for two weeks at the London Coliseum. She periodically returned to India to dance. By 1916 she was dancing in the USA where she gave numerous recitals, appeared in productions, danced with Adolph Bolm’s multi-cultural Ballets Intimes and taught. (Bette Davis was for a time one of here pupils. Her life and work are documented in Roshanara ‘Secrets of Oriental Grace’. Dance Lovers Magazine February 1925 pp.35, 36, 66 and substantial obituary articles by Talley: ‘The Story of Roshanara A Short Biography of That Great Englishwoman Who Brought the Art of the Orient to the Eyes of the Western World’ The Dance November 1926 pp.10 – 13, 51; and ‘Always a Wanderer, She Brought the Rich Beauty of Oriental Art to Many Lands’, The Dance December 1926 pp.41, 42, 50. "Hetta dear/With love from/Yours Tenderly/Roshanara/18.9. '13"
Handwritten annotation in pencil, bottom right hand corner.